In 2004 I wrote Brazil and Lula: Year Zero (Edifurb: Blumenau, Sao Paolo 2005), in which I presented my analysis of the Lula-Workers Party (PT) regime in Brazil undergoing a Grand Transformation with the first stage represented by the PT’s incorporation into a government apparatus led by of bankers and exporters (the agro-mineral elite). Two year earlier, my colleague, Henry Veltmeyer, and I had published Cardoso’s Brazil: A Land for Sale (Rowman and Littlefield, Lanham MD 2003) where we described how President Cardoso had sold off the major public resources, banks, petroleum and iron resources to foreign capital for rock bottom prices. 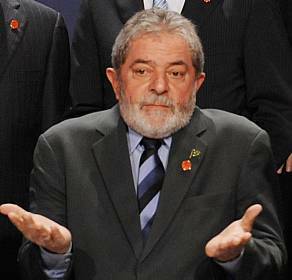 The 2002 election of President Lula Da Silva of the Workers’ Party did not reverse Cardoso’s sell-out. 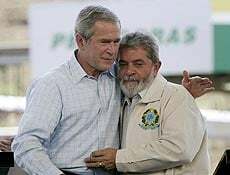 Indeed, Lula accepted his predecessor’s neo-liberal policies – embellished them – and set about forging an alliance between the Workers’ Party and the economic elites, replacing Cardoso’s Party! For the next few years, we were attacked by the Left academic and pundit world for having dared to advance such a critique on their ‘worker president’! The consequences of what we had described as the PT’s pact with the Right are clear to everyone today: Brazil is enmeshed in swindles, scandals and coups. “The nature of the multitude is to arrive rapidly and depart swiftly”. For more than a decade, left-wing parties, accompanied by working class trade unions and landless rural social movements, dominated Brazil, the largest country in Latin America. Their political leaders were repeatedly elected; their trade union and rural social officials secured concessions from the state; the political process followed legal procedures adjudicating its agenda with the opposition business, banking and professional parties. We were told the days of coups and revolutions were passed. Electoral processes, honest vote counts and mutual recognition of political legitimacy precluded any violent, dismissal and ouster of the established Left political leadership. The dominance of the Left is now only a memory! Its parties are in full retreat. Its leaders are scorned, insulted and prosecuted by their former political allies. The business allies of the past are now at their throats. Those politicians, who secured government positions in return for loyalty and votes, have fled clamoring for ‘impeachment’ and claiming deceit…while seeking new sources of patronage and plunder. The great left political leaders, who had once bragged of 53 million voters, who were hailed in the international press for their command of a huge mass base while accommodating the interest of modern trade and business, are now condemned by the capitalist media as the cause of the current economic calamity. The popular heroes of yesterday, who shared wealth and status with their rivals in the business elite, are now ostracized and facing show-trials for corruption. Veteran trade union and rural leaders came to the Presidential Palace to celebrate the electoral successes of the ‘worker president’. The mass popular organizations are now without allies in Congress; their voices are shut out of the bourgeois media; the domestic economy has been abandoned by the market; and the masses are in the streets clamoring for retribution against the politicians betrayal. Now trade union and peasant leaders appeal for resistance and a return to class struggle; but their followers are in retreat! The rise and fall of the Left is a historical reversal, which requires a systematic analysis of a disastrous strategy. The left’s defeat cannot simply be dismissed as a betrayal by treacherous allies, corrupt party officials or plots concocted by billionaires and the US Embassy, leading up to a coup via a clearly phony impeachment process. The real question to ask is: Why did the Left allow such treachery and betrayal, culminating in a legislative ‘coup d’état’, to develop unopposed leading to reversal and rout of the Left? How could a huge multi-million-person voting machine, a vast and experienced trade union apparatus and a militant rural social movement fall defeated without even a struggle? The Left parties deliberately adopted a short-term strategy of accommodation with the right, in part to avoid long-term, large-scale strategic confrontations with the defeated economic elite. For their part, the parties of the Right and their US advisors patiently chose to accept the Left’s compromises and offers of cooperation, in order to prepare for a strategic offensive when the Left’s mass of support had declined. The Left parties embraced poorly thought-out ‘short-cuts’ to governance. They occupied government posts while cutting cozy deals with all the major power brokers of the Right. The Left signed ‘austerity’ agreements with the IMF to restrain budgets and accept debt obligations. Members of notorious rightwing and opportunistic political parties were brought into the cabinet, assigned strategic congressional leadership positions and placed on senior presidential advisory panels in exchange for their votes to approve loans, credits and regional development projects. The Left negotiated deals with business elites, offering them generous subsidies and high profits, while restraining workers’ demands for structural changes. They viewed this accommodation as an exchange for economic growth, wage increases and trade union recognition as a legitimate power sharer. The Left dismissed the grassroots demands for social transformation and they opposed any popular campaign to prosecute the financial elites for money laundering and white-collar crimes. Instead, they favored incremental increases in wages, poverty funds, pensions and consumer credit. The Left ignored the reality that such arrangements with the business elites were only a temporary truce rather than a permanent, strategic alliance. The trade unions followed the lead of the Left political leadership. They directed their mass organizations to accept negotiations based on periodic wage increases, more funds for trade union education and subsidies for new union building complexes. The trade union leaders discouraged strikes, repressed demands for public ownership and prevented any investigation into mining, banking and agro-business corruption, tax evasions and bribery. Even the well-documented wave of assassinations of landless worker activists and the naked land grabs of ‘protected’ Indian territories went unpunished. The business elite realized they faced a potential radical mass movement, which was under the control of an elected ‘Left’ government. They were ‘delighted’ that this Left government was so willing to accommodate capitalist demands. They cautiously decided that short-term rewards and well-placed bribes would help prepare the ground for their restoration to power and reversal of the left’s concessions. The Left rural social movements retained their radical socialist rhetoric and mass membership, but their leadership followed the Left parties in government. In exchange for subsidies to set-up and expand community-based rural organizations and training schools for farmworkers, the social movements mobilized their mass activists to ‘turn-out the vote’ for the Left parties’ President and Congress people. The rural movement leaders justified their accommodation with the Left- business alliance describing the Left regime as a ‘field of contention’, where they could press for radical changes. After more than a dozen years of successful mass struggle, the radical rural movement chose to ally with the Left party apparatus! Only when the ‘Left President’ was impeached did the rural workers’ leader call for the return to class struggle! (1) Their governance for over four administrations where they increased or maintained the left’s voting majority. (2) ‘Pragmatic’ political alliances with parties across the spectrum – won through various forms of bribery – as a formula for winning Congressional approval for major development contracts. (3) Their funding of opposition allies, which attracted ‘respectability’ and enriched both Left politicians and their electoral campaigns. (4) The decrease in social tension achieved by recruiting business opponents and gaining support among sectors of the capitalist class. The Left political leaders’ strategy of accommodation depended on the economic success of the mineral-oil-agriculture export elites. This ignored the business sector’s fundamental policy of cutting social and productive investments whenever markets, profits and economic opportunities declined. When the Left regime’s public subsidies for the export industry declined following the collapse of the global commodity market, the entire capitalist elite coalesced into a virulent Rightwing opposition. When the previous political accommodation with capital, held together by corruption and questionable subsidies became the target, the Right launched their strategic offensive. The fact that business, banking, media and agro-mineral elites were able to join forces so quickly and launch their attack on the Left shows how they had flourished for a decade during the commodity boom. The entire façade of a ‘broad progressive coalition’ disappeared: The trade union and rural movement structures, linked to the Left political leaders, were incapable of mobilizing their mass base and countering the insurgent Right. For over ten years, the Left regime had cut all its political deals in Congress, in the corridors of elite power, while ignoring ‘class struggle’. This was a ‘Left’ regime, wholly dependent on market conditions and business allies. It was unable to defend any strategic ground when the Right regained its power base. The Left regime had retained an intact and fully functioning right administrative and judicial apparatus, composed of courts and judges, the prosecutors and investigators all aligned with the Right opposition. They were ready to undermine the regime’s congressional majority by opening ‘corruption’ investigations targeting the Left. Meanwhile, the business elite managed to intensify the consequences of the economic recession and insist that ‘recovery’ meant austerity against the poor. The Right purchased its street crowds and mobilized its party allies, including the center, the fascists, the neo-militarists, the agro-business elite and the imperial and local financial press. From Sao Paulo to New York to London they were poised to forcibly oust the elected Left President from power and jail its leaders. The Left believed in the myth of democratic capitalism. They had faith that their negotiations with the business elites would increase social welfare. They operated on a platform of gradual accommodation of class interests leading to multi-class alliances and strategic conciliation between business and labor. The historical lesson has proven otherwise – again. Business and the capitalist elite make clear, tactical short-term agreements in order to prepare a strategic counter-offensive. Their patient long-term strategy was to mobilize their class allies and overturn the electoral process – at the ripe moment. The Left parties depended on achieving a series of ‘strategic understandings with the capitalist class’ where both would benefit at a time of peak global demand for Brazil’s commodities, instead of expanding their popular mandate by transforming the economy and domestic market. The Left behaved as if favorable world market conditions would last forever. They lost their chance to use their 53 million-voter strength and radically change the organization and ownership of Brazil’s strategic economic sectors! In this way, the Left imitated the Right, choosing to share its power bases through accommodation with their business-partners. These were amateurs at the bourgeois power game, who found themselves entrapped in corruption and crisis! How shocking! It was so much easier for the Left politicians to get campaign funding through the usual practice of business payola than to campaign from door to door, factory to factory, village to village, fighting repression, elite media boycotts and armed vigilantes. In the end, their ‘power base’ dissolved and their capitalist ‘partners’ and political ‘allies’ abandoned them: the Left President was impeached. Capitalists have never and will never recognize weak popular opposition. The capitalist political elite will always choose power and wealth over social democracy. The Left, in retreat, isolated and expelled from the corridors of power, now face retribution from the most corrupt and treacherous of their ‘former allies’. They usher in a lost generation.